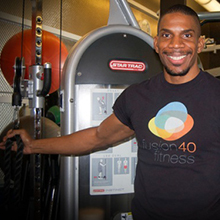 Wil Turner, founder of Fusion 40 Fitness has been a client of the Dallas SBDC since February of 2013. The SBDC has been instrumental in helping Wil develop his business plan, apply and obtain a micro loan, conduct marketing research, and introduce him to other small business resources in Dallas County. Mr. Turner first opened Fusion 40 Fitness in 2005 in New York after seeing a need for programs for people who couldn’t afford private training. He says it was quite challenging financially at first and still is, because he aims to provide services to people who cannot afford them. Business wasn’t thriving in New York, and eventually Wil decided to take Fusion 40 Fitness to Texas with the hope of finding success. He understands the value of small business programs and has taken advantage of resources from the Dallas SBDC, ICDC, People Fund, Dallas Voice, GEAR (For Gender Equality and Acceptance at Resource Center of Dallas) and SCORE. Wil Turner’s small business success includes his recent graduation from the PeopleSpark program hosted by Peoplefund, a micro lending organization with an office in Dallas, TX and lending partner of the Dallas SBDC. His story has been featured in the Dallas Voice Magazine and the Dr. Michael Harris Blog Talk Radio Show. Fusion 40 Fitness supports the health endeavors of those seeking to live healthier, happier lives in MIND, BODY and SPIRIT. The company specializes in developing exercise programs that are time efficient, effective, fun, affordable and especially tailored to the fitness goals of all the clients they serve to ensure they receive the best service in nutrition consultation, wellness and life coaching, private training, group exercise, functional training and injury prevention training for health maintenance and looking great!